Despite their enormous success across four decades, Deep Purple are a band who have seen only a few books devoted to their history. And none as comprehensive as this. Centred on the band's break-through album Deep Purple In Rock the book concentrates on a crucial two year period for them starting in mid-1969 as they sacked founding members and began a search for replacements. Indifference to their earlier work had left them almost unknown in Europe, and their American label (which had given them a top five hit there) was on the verge of collapse, leaving royalties unpaid. It was only with a change in personnel and a determined period of intense rehearsing, writing and gigging that they managed to reverse their fortunes. In Rock also proved to be a milestone in the history of rock music, influencing countless groups and musicians in the four decades since it first appeared. It not only defined the band's new direction, but firmly established Deep Purple as one of the biggest rock bands of the seventies (and beyond). It also laid the groundwork for the successful and artistically creative period which followed. 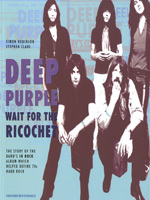 This book (which has been eagerly awaited by fans, with pre-publicity on Deep Purple websites and blogs) covers their early rehearsals, concerts and recording sessions and carries on through 1970 as the band experience the early highs of widespread chart success with the album (number one in Germany for three months, and in the UK charts for over a year) and hit single Black Night, as well as the lows of riots, illness and sheer exhaustion. Bringing the strands of the story together for the first time along with unseen material, rare photographs, chart details and concert listings, the book provides a detailed narrative of this important phase of Deep Purple's career. Jon Lord was interviewed specifically for the book. Roger Glover has also provided new insights on the writing of the album and Ian Gillan offers a fresh look at Child In Time. Studio personnel, former managers and others have also contributed. Deep Purple became an extraordinarily impressive live act, with a strong improvisational spirit flowing through their concerts, setting them apart from many of their contemporaries. The band's approach to recording took its cue from these shows, drawing on their live experiences to develop the album. As Ian Paice recalls: "Purple should never have worked. Basically we had five egomaniacs. There was just a magical chemistry. I can't think of any other band that's been allowed that much freedom for all the members to do exactly what they wanted." Deep Purple In Rock took almost a full year from inception to release. As such it remains both a remarkable snapshot of the band at that time, as well as a reflection of a very prolific and progressive period in the British underground scene as the psychedelic sixties gave way to the more aggressive and focussed rock music of the seventies. In doing so, the book offers a useful overview of the time for rock historians. And unlike most rock histories, which squeeze a few pages of photographs into the middle of a regular paperback, Wait For The Ricochet is generously illustrated throughout. Today, it is generally acknowledged that the story of hard rock (or heavy metal) owes it's origins to the British triumvirate of Led Zeppelin, Black Sabbath and Deep Purple. The first two have been more than adequately catered for in print. This book restores the balance.